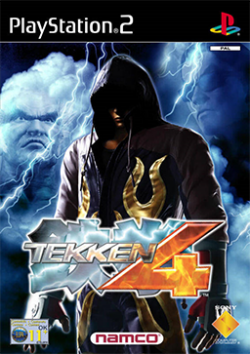 Game description: Tekken 4 marks the return of Namco's premier fighting franchise, Tekken. This version features enhanced graphics, gameplay mechanics, and fearsome fighters. Newcomers engage old favorites in interactive, multileveled arenas. The addition of walls, terrain effects, position changes, and enhanced sidestepping will force you to adjust your fighting strategy. Expanded game modes such as Training, Team Battle and the new Tekken Force provide the player with a deeper gameplay experience. Description: Vertical black lines appear when running the game in Hardwar mode with any higher than native resolution. Workaround: Go to Config > Video (GS) > Plugin Settings, turn on "Enable HW Hacks", click Configure Hacks, and enable the 'Align Sprite' hack. For Custom Resolution use a 1260x(any) resolution. It's possible to subtract any multiple of 60 from 1260 (eg, 1200, 1140, 1080, etc) as needed for performance, but no horizontal resolution greater than 1260 works. Vertical resolution has no effect on the black bars, so this can be set to any desired value. This page was last edited on 9 March 2018, at 17:31.